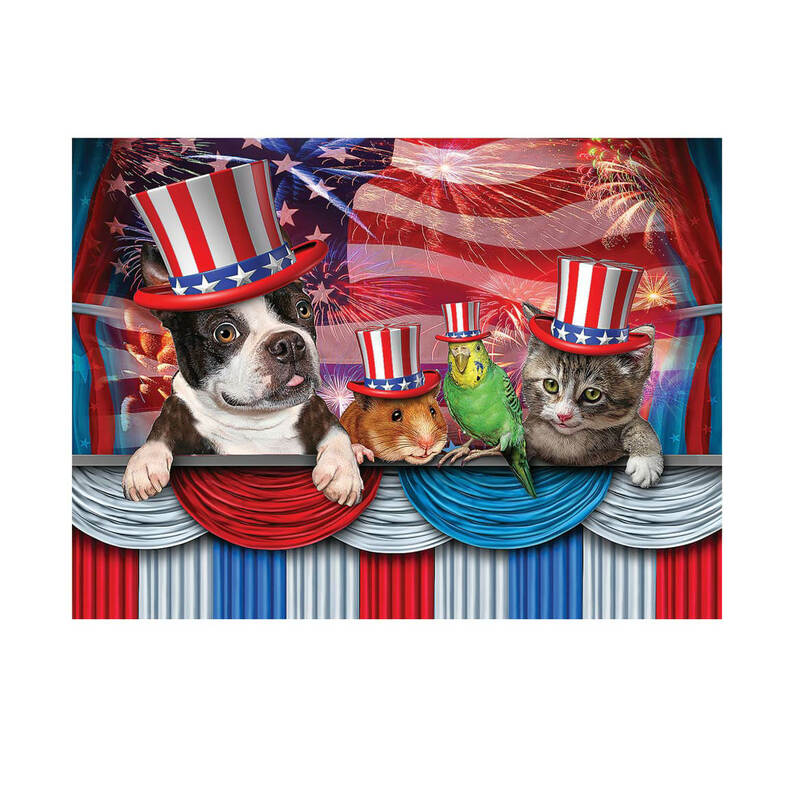 Donning stars and stripes in red, white and blue, this Pets Love America puzzle is stylish, proud—and adorable, too! Patriotic pets display star-spangled spirit in this heartwarming image, making our 1,000-pc. jigsaw an American treasure. Rendered in bold, vivid colors with intricate detail, it’s sure to make pet lovers, puzzle lovers and patriots smile. The quality jigsaw puzzle makes a great gift for patriotic holidays or any occasion, and assembling a puzzle is a simple way to bring your family together, any time of year. Cardboard. Pet puzzle measures 19 1/4″ long x 26 3/4″ wide. SMALL PARTS. Not for u003c 3 yrs. Fun, challenging Picture Puzzles 2 tests your powers of observation when you compare two pictures to find subtle differences. “Remember When?” includes vintage photos and nostalgic trivia. 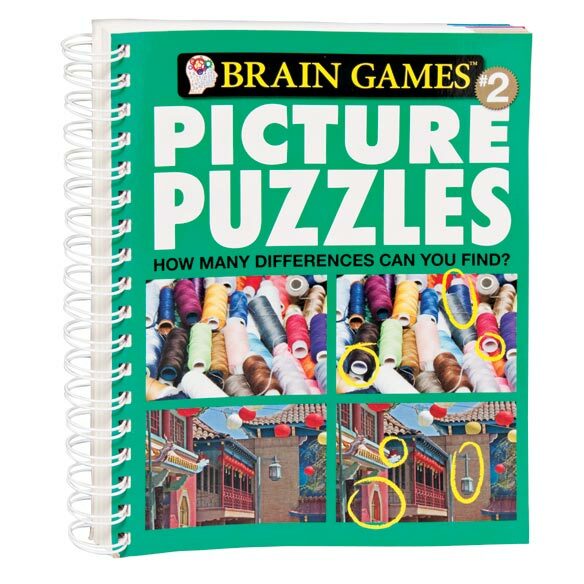 Brain Games™ Picture Puzzles books are spiralbound softcover, 192 pages. 9″ long x 7 1/2″ wide. 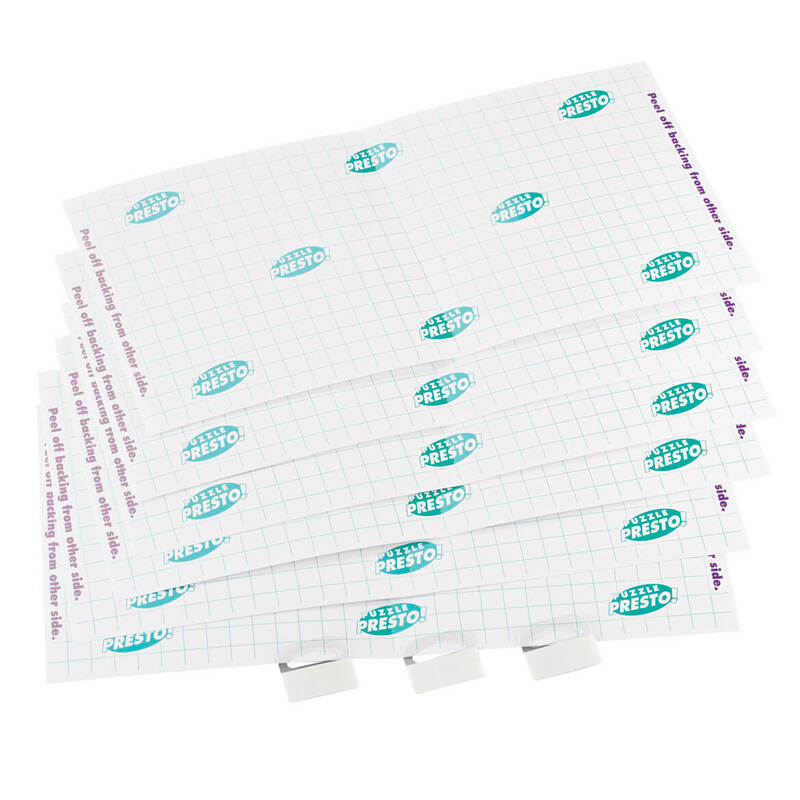 Puzzle Presto® Peel & Stick Puzzle Saver™ saves puzzles instantly, easily and permanently … so you’re not stuck with tedious gluing, drying or messy cleanup! Simply peel off the puzzle mat’s protective paper and press to the back of your completed puzzle for a neat, immediate bond—preserving your puzzle with original finish to display and enjoy for years to come. Package includes: 6 peel & stick adhesive puzzle savers (15″ x 7/5″ each), 2 adhesive hangers and directions—preserving one puzzle up to 29″ x 21 1/2″ or two puzzles up to 21 1/2″ x 15″ each. Puzzle lovers can now work smarter, thanks to ingenious puzzle sorting trays that let you sort pieces by color, theme or border—making it easy to assemble your puzzle and “save” your work to take a break. With pieces neatly organized and stored together in these puzzle trays, you can return to your unfinished puzzle and continue, right where you left off. A perfect gift for puzzlers of all ages! 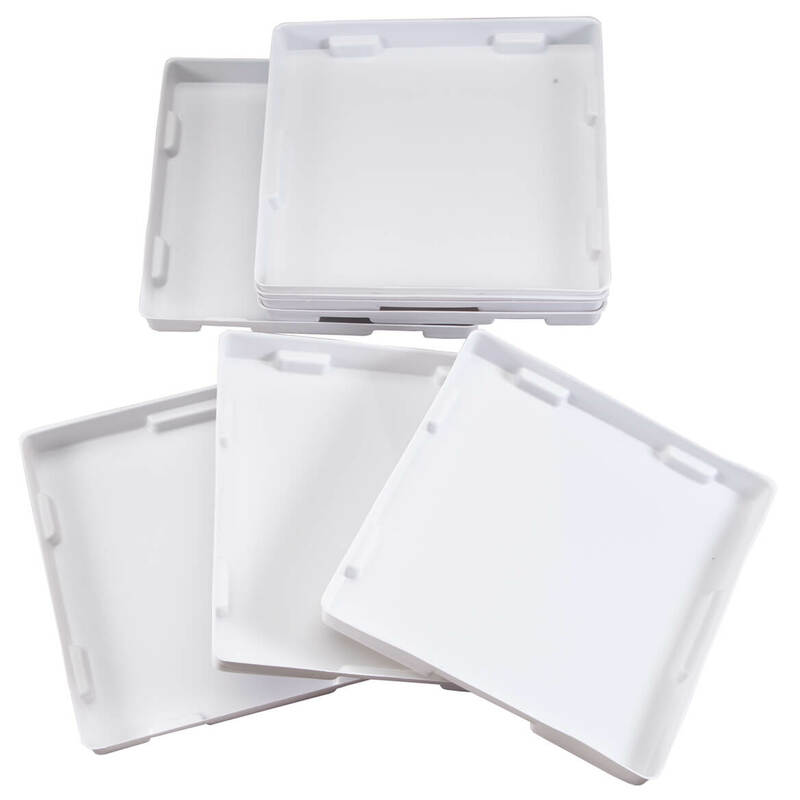 Set of 8 shallow plastic sorting trays stacks for neat, space-saving storage. Each, 7 1/2″ long x 7 1/4″ wide x 7/8″ high. Keep your Scrabble skills sharp with these challenging Scrabble puzzle books — and build your vocabulary while boosting your brain. 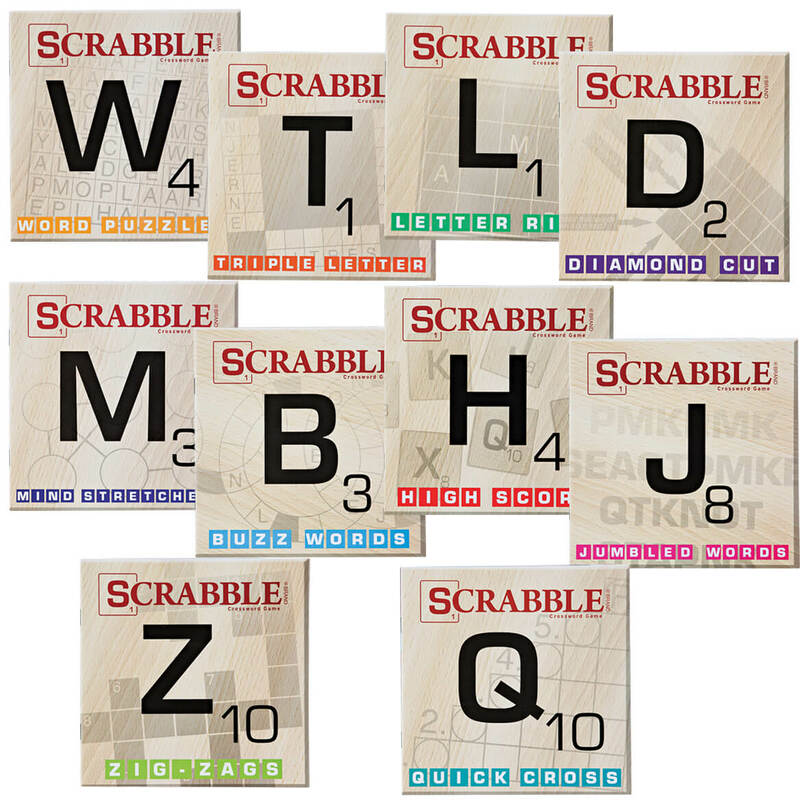 A high-scoring gift for any Scrabble fan on your list, each Scrabble book is perfect for home, travel or game night fun. The set of 10 includes: Triple Letter, Word Puzzles, Quick Cross, High Score, Jumbled Words, Zig-Zags, Mind Stretchers, Letter Rip, Diamond Cut and Buzz Words. All softcover, 32 pages. 7″ sq. 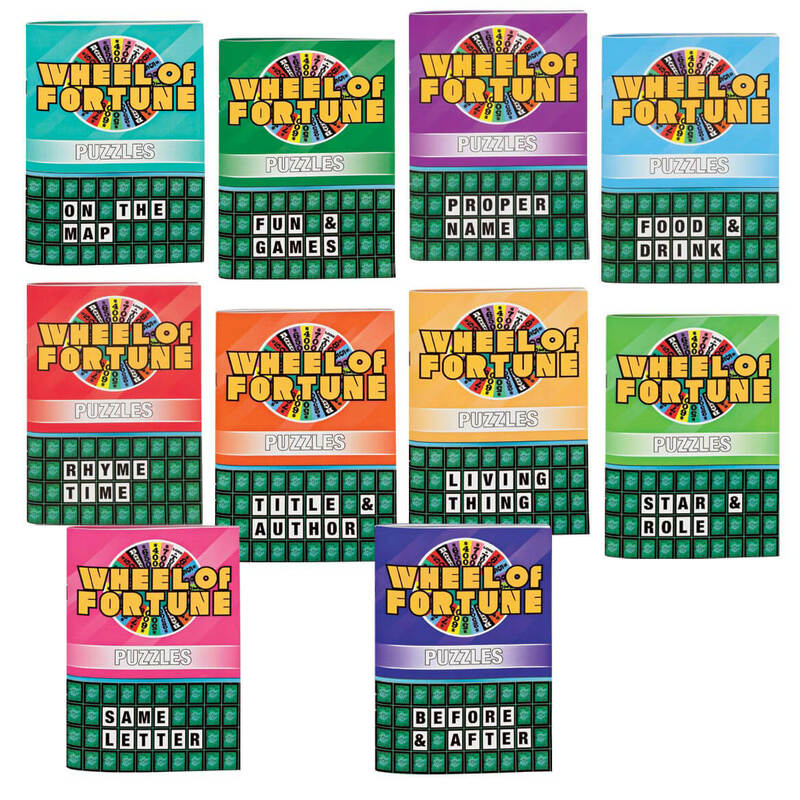 Providing Wheel of Fortune challenge to enjoy at home or on the go, these Wheel of Fortune puzzle books are a letter-perfect WIN for puzzle lovers! Helping keep your mind sharp with a fun assortment of themes, each book features 27 puzzles, including classic Wheel of Fortune puzzles, along with answer keys. Set of 10 includes: On the Map, Before & After, Same Letter, Star & Role, Living Thing, Title & Author, Rhyme Time, Food & Drink, Proper Name and Fun & Games. Softcover, 32 pages each. Word puzzle books measure 9″ long x 5″ wide each. 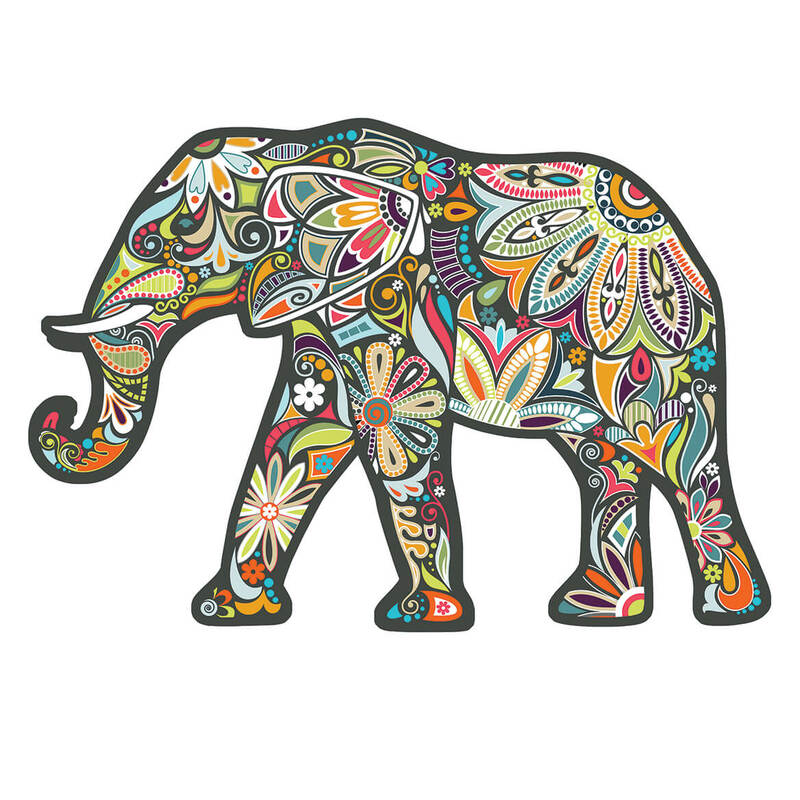 Put the pieces of the Paper House 370 piece Elephant puzzle together to reveal a colorful elephant and its silhouette. This 370-piece puzzle features die-cut-shaped pieces that interlock easily to create a smooth-finished image. Made of greyboard. For Ages 8 and up. 26″L x 161/4″W. A few minutes a day may be all you need to boost brain power with this assortment of stimulating mind puzzles! 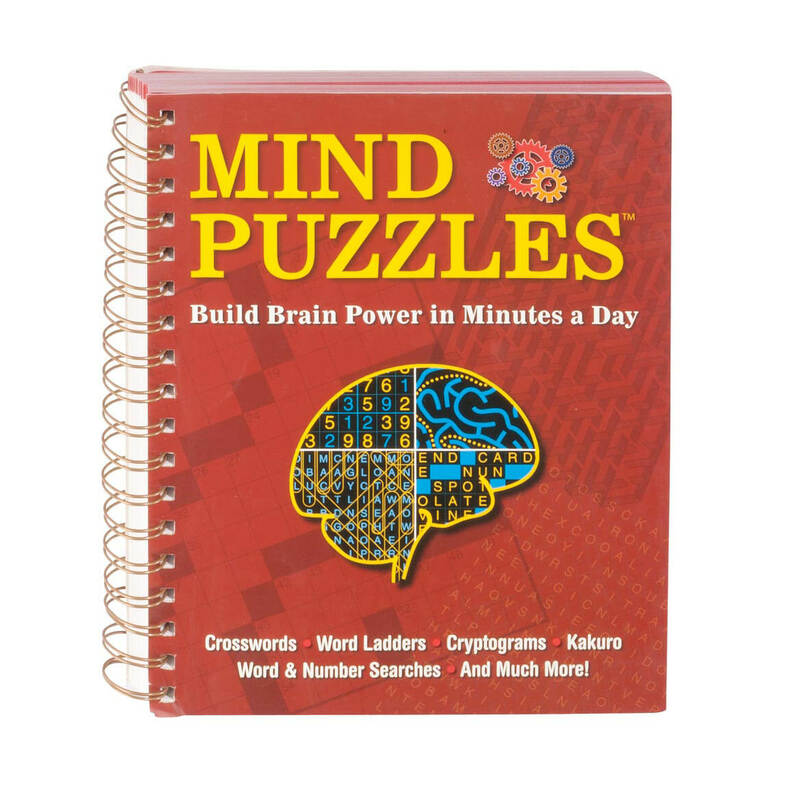 Featuring a variety of word, number and logic challenges specially designed to maintain your brain, Mind Puzzles™ Book includes crosswords, word ladders, cryptograms, Kakuro, word & number searches and more. Helping keep your mind sharp, the puzzles are compelling, engaging, sometimes frustrating—and always fun! Spiral-bound softcover, 192 pages. 9″ long x 7 1/4″ wide. Welcome back the most fascinating and baffling puzzle ever invented! This faithful reproduction of a 1933 original 15 puzzle features smooth-sliding stainless steel tiles and travel pouch. 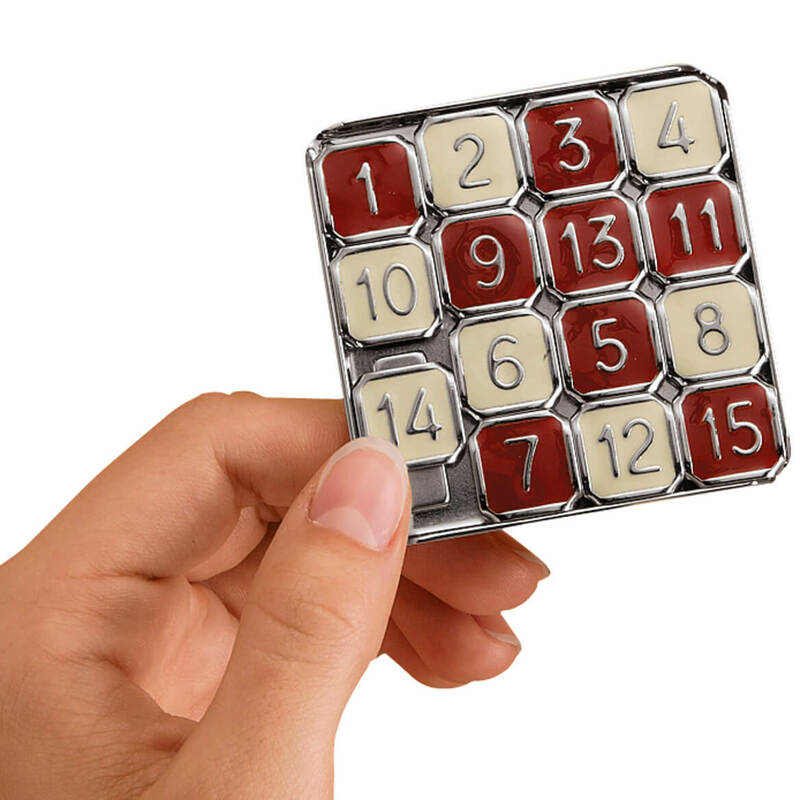 A fifteen puzzle promises hours of fun, with over a trillion possible combinations of the numbers 1 to 15! 2 1/2″ square. Includes storage pouch. Bringing hearts back to simpler times, this Old Candy Store 1,000-pc. 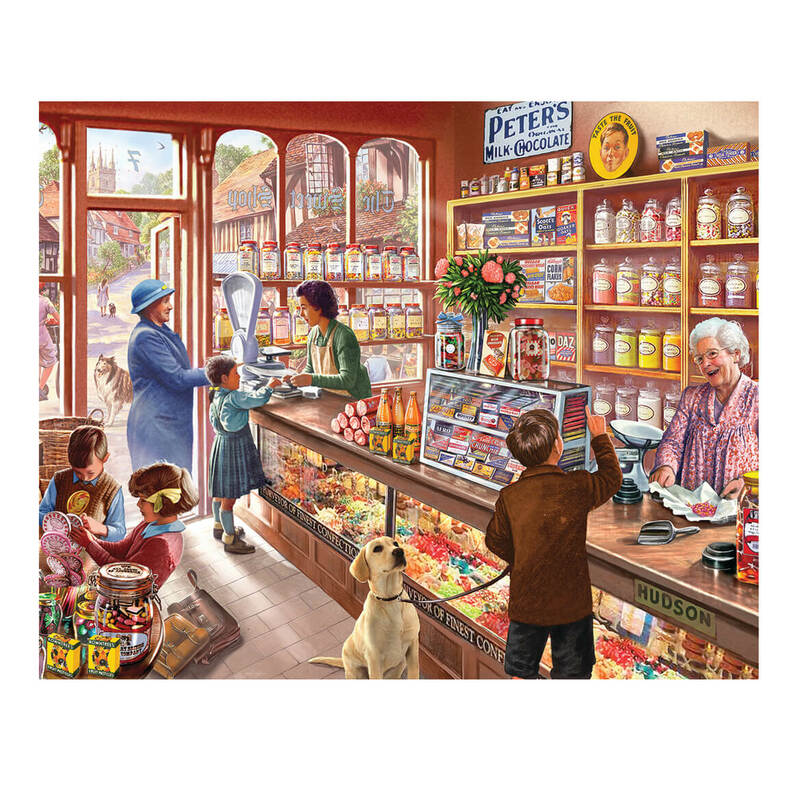 puzzle’s nostalgic scene features a corner candy shop—where sweet treasures were weighed and tucked into little white bags for young customers to cherish. Boasting intricate artwork with exceptional detail, the 1,000-piece jigsaw puzzle is sure to challenge the puzzle lover on your gift list. Fun for families to assemble together, our quality puzzle inspires folks to unplug, relax and keep their brains fit! Cardboard. Finished 1,000-pc. candy puzzle measures 24″ x 30″. SMALL PARTS. Not for u003c 3 yrs. Cardboard; 1000-pc. puzzle; 24" x 30"